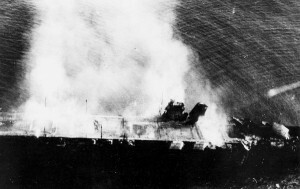 Carrier Hosho performs air operations around the time of the Shanghai incident. The aircraft carrier Hosho has a special place in the history because it was the first commissioned vessel that was entirely planned and constructed as an aircraft carrier. 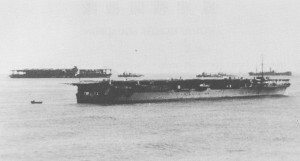 in addition, it was the first aircraft carrier of the Imperial Japanese Navy (IJN). 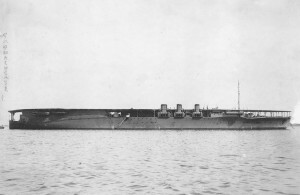 First, after commissioned in 1922, the Hosho participated in training carrier aircraft operations. essentially, most of the experience of the IJN in carrier operations came from the experiences done in the Hosho. By following aircrews suggestions, the superstructure was removed to facilitate flight deck operations in 1924. 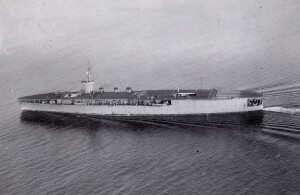 The aircraft carrier Hosho, before the Second World War was involved in several major operations. 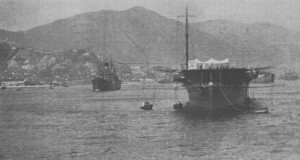 The air group of Hosho participated in the response to the Shanghai Incident in 1932. Later, she also joined operations in the Sino-Japanese War in late 1937. in both conflicts the role of the Hosho was to support ground operations and obtain air superiority against Nationalist Chinese Air Force. Because the Air Group of the Hosho was not large (only 15 planes), the effectiveness of these goals could not be so high. After theses combat experiences, the Hosho took a secondary role and was assigned to training duties from 1939. 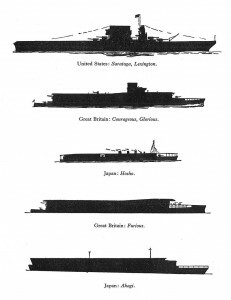 Comparison of the carriers size in 1936. Although still in a secondary role, she also participated in crucial battles during World War II such as the Battle of Midway in June 1942. After that battle, she was back to homeland and continue training new aircrews. She could survive the war with minor aerial attacks and was actively used to repatriate survivors of sunk ships, Japanese soldiers and civilians from continental Asia, China, and other locations. 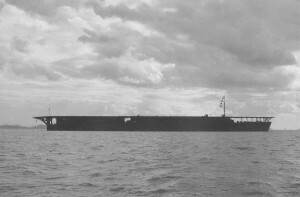 For example, in October and November 1945, escorted by the cruiser Kashima, Hosho could transport 700 persons from Wotje Atoll, 311 from Jaluit Atoll, and an unknown number from Enewetak Atoll to Uraga, Kanagawa. In total,the small vessel did more than nine repatriation trips before 15 August 1946. A total of 40,000 persons were transported. She was finally scrapped in 1946 due to her obsolescence. The physical details of the Hosho consisted of an overall length of 168.25 meters (552 ft 0 in). The beam had 17.98 meters (59 ft 0 in) and a meandraft of 6.17 meters (20 ft 3 in). The displacement had 7,470 long tons (7,590 t) at standard load, and 9,494 long tons (9,646 t) at normal load. Her crew consisted of 512 officers and men. and did not have any relevant weapons beside the air group. The Hosho had a normal capacity of fifteen aircraft. Basically, she was very limited due to the size of the hangars. The first commissioned air group consisted of nine Mitsubishi 1MF (Type 10) fighters and three to six Mitsubishi B1M3 (Type 13) torpedo bombers. Later, in 1928, these planes were substituted by the the A1N1 (Type 3). in 1931, the air group was composed of Nakajima A2N (Type 90) fighters and Mitsubishi B2M (Type 89) torpedo bombers. In 1938 Nakajima A4N (Type 95) fighters and Yokosuka B3Y (Type 92) bombers could take-off from the ship. New improvements were done in 1940 to adapt the ship to modern planes such as Mitsubishi A5M (Type 96) “Claude” fighters and Yokosuka B4Y1 (Type 96) “Jean” bombers. 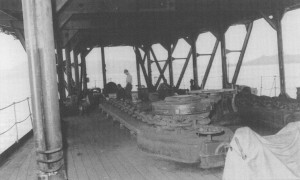 A view of the underside of Hōshō’s narrow flight deck looking from the forecastle forward. Photographed in October 1945.